Christmas present: a punching ball. In my family we do a non-anonymous Kris Kringle for the adults. This fell into the category of a specific request. Keen to avoid the all-too-common strategy of asking for a gift voucher (if this pattern goes on, we’ll end up just exchanging direct debits via net bank) I thought I’d throw the punching ball into the list as something I kinda wanted to try, but might be reluctant to buy myself. Sure enough my KK came through with it, getting me the punching ball and a Rebel Sport voucher to go towards boxing gloves to go with it. I suspect it looks slightly ridiculous to see a 40+ weedy weakling bashing away at it. Whether it would provide any substantial exercise benefit probably depends how long I go at it (in each session, and how often), but at the very least it could provide a nice bit of stress relief. Actually, that’s not a bad present. You are certainly in the low-weight division. Maybe you could pretend the ball was Mr Mulder? Why would you have been reluctant to buy it yourself? Been a while since I’ve commented here, but I had to when I saw this post! 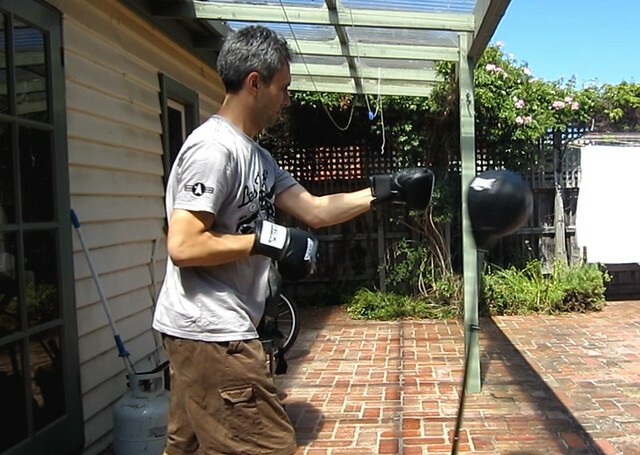 You wouldn’t believe it, but I bought the very same Everlast spring-loaded punching ball/bag about three weeks ago, along with the Everlast boxing gloves (Everlast incidentally is Rocky Balboa’s brand)! I’ve been using it every weekday since then for about half an hour, and it’s a great workout! You’ve got to be quite fit for it- thankfully over the last half year I’ve lost about 35kg and gotten back into shape, there’s no way I could have done it earlier! A word of advice Daniel- after about a week or so of using it, the inflatable ball inside the main ball punctured, which was very frustrating. Rather than take it back, I was able to undo the cup under the ball by undoing the nut (there are actually two plastic cups- one that overlaps the leather, one that goes under), remove both cups, and removing the inflatable ball, which was punctured at one of the seams. When repairing it with a bicycle repair kit proved fruitless, I went back to Rebel Sport, bought myself a suitably sized soccer ball, along with some foam from Clark Rubber. I cut the foam into small strips, and lined the lower part of the bag with it. I then deflated the soccer ball, inserted it into the bag, reinflated it, then packed the rest of the space with foam, before replacing the cups and the nut over the bag. It’s been working fine since, though it is a little slower to respond, and a little harder to punch, but takes a lot more punishment now, and I don’t have to worry about it deflating anytime soon! I’m happy with it! Hope that helps you out a bit Daniel! I had one when we lived in Adelaide and loved it. It was one of those you hang from the ceiling, like a huge tonsil and it got quite a hammering. Good stress relief and it absolutely kills when you punch hard and often with your arms up as high as you can.